Aussie chicks on the run, underground Las Vegas turtle racing and the mob all add up to one hilarious film from director Tyler Farr. 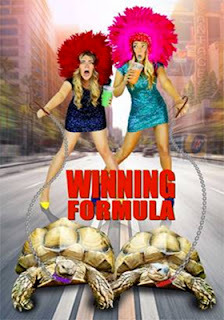 It is titled Winning Formula and it will be available on DVD Sept. 18 courtesy of Indican Pictures. On a whim, footloose and fancy free Tilda (Claudia Pickering, who also co-wrote and produced … plus such films as Frisky, Australian Enemy) and her friend, Liz (Prudence Vindin), decide to pay a visit to Las Vegas. The idea is to have fun, party and enjoy the moment. Which they do, but in enjoying the lights and party atmosphere of Las Vegas they get sidetracked by the charming Jose (Charles Britton), who double-times them with his buddy Benito (William Guirola), and before you know it they are caught up in a high-stakes bet on turtle racing!!! Turtle racing!!! Is that even a sport? In any case it quickly goes south and they suddenly find that they owe the mob ten grand, they are dead broke and naked at the side of the road … and have three weeks to pay off their debt. Naked Aussie girls in the desert and dead broke. It is at this very moment, when all seems lost — and the next car coming by could lead to some real nasty business — that their luck changes and the driver who comes to their rescue is Maci (Angela Gulner — Molly Takes a Trip, The Labyrinth, 'Til Death Do Us Part, etc. ), who is just as goofy as Tilda and Liz. Once in Los Angeles, they meet Nigel (Peter J. Walters)— who is ultra strange —and the rest of Maci’s friends. Three weeks, clock ticking and they need to come up with a plan — the “winning formula” — or the next time they are naked in the desert it could be at the bottom of a six-foot hole. The problem is — and this is the hilarity to be found in Farr’s Winning Formula — that every plan that Tilda and Liz come up with is as goofy as they are. So what is an Aussie girl, no, make that two Aussie girls, to do in La La Land to get out of this very big problem? Be creative in a “Down Under” way of course!! !